Once again, the State is trying to terrorise by means of sudden raids against occupied self-organized spaces. Villa Amalias squat is housed in the building of Heyden and Acharnon street for 22 years. Within the squat hundreds of political and cultural events have been held (concerts, theatrical performances, screenings etc), while the anti-commercial culture that opposes the culture of sale and profit, power and property has found its place. It is clear now, after so many daily attacks against the antiauthoritarian/anarchist movement, that the antisocial forces of economic and political authoritarianism aim at silencing the movement, at limiting the public discussion in the agenda that is determined solely by the mainstream media and the Nazis, at prohibiting self-organized actions that start from below and outside political parties. 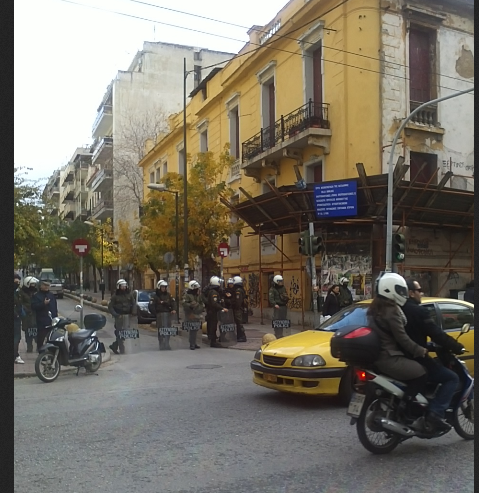 According to info published on Athens Indymedia, 8 comrades from the occupation were detained, and a search is being conducted in the building by the forces of state repression. Already, 200 have gothered in solidarity at Acharnon Street opposite the occupation. 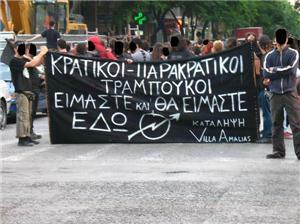 We express our solidarity to Villa Amalias and to the comrades who struggle in this free social space. PS: We understand the joy of the faithful servants of the system of power, as we observe the far-right blogs, as well as the mainstream news sites joining forces, slandering and cheering for the “success” of the suppressive State. We promise that the delight of the enemies of society will not last forever. UPDATE, 17.35 GMT+2 An anarchist assembly has been called for 8pm tonight (Athens time) at the Athens School of Economics for updates on today’s events. 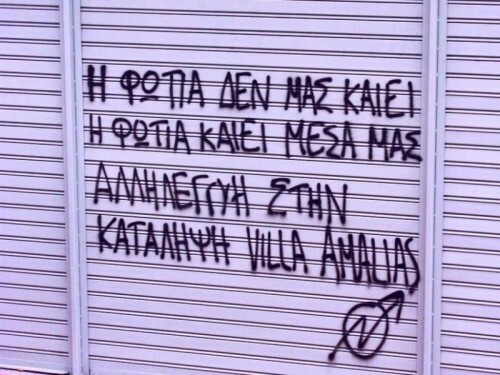 UPDATE, 16.35 GMT+2 According to a statement by the minister of public order, Nikos Dendias, the order to evict Villa Amalias was given “by PM Samaras himself”. UPDATE, 16.15 GMT+2 Solidarity gatherings have already been called in the cities of Thessaloniki, Patras,Heraclion, Karditsa and Veroia, with more added to the list by the hour. About 200 anarchists and people in solidarity are gathered outside Villa Amalias itself. UPDATE, 14.20 GMT+2 The seven anarchists who were detained earlier at the Athens Town hall (see update at 11.35 GMT+2) have just been released. The eight people who were detained inside Villa Amalias when the police raided this morning are still under detention. UPDATE 11:55 GMT+2 Villa Amalias has issued an immediate call for people to gather outside the building in solidarity. UPDATE 11:35 GMT+2 There are unconfirmed reports that riot police have detained a group of anarchists who had entered the Athens Town Hall in order to protest against the ongoing police operation against Villa Amalias. At approximately 07:00 GMT+2 on December 20th, riot police raided the anarchist squat Villa Amalias in Athens. Eight people were detained inside the building, while the police are now searching in the presence of an ninth person who was also in the building at the time of the raid and who is acting as witness to the search. It is expected that this person will also be detained at the end of the operation. It is still unclear whether or not the police intend to evict the squat. People are already gathering in solidarity outside the squat in big numbers.